Nigel Farage, leader of the UK ‘Independence’ Party, claims he suffered from “anti-English racism” on his visit to Edinburgh last week. Farage was heckled by dozens of protestors, and his get-away taxi was blocked by a woman in a wheel chair before he could flee back over the border. 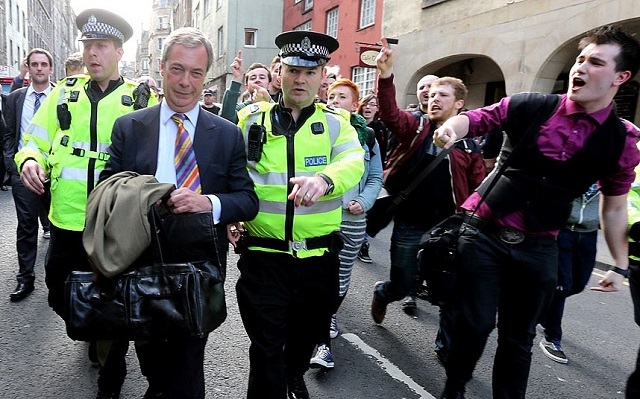 The hostile response Farage received in Scotland was refreshing for some inhabitants of southern England, myself included, who feel isolated by the saturation of UKIP in our politics and media. Their press coverage is disproportionate to their voters, suggesting a worrying appetite for reactionary politics among journalists. Here was a reminder that outside the UKIP sphere of influence (south-east England), Farage and his followers are seen as “scum”. Astonishingly though, Farage had the nerve to call his critics “fascist”, “racist” and “xenophobic”. There is a helpful consequence of Farage conflating these three terms. His own policies are clearly xenophobic. The fear and loathing of foreigners from eastern Europe is integral to UKIP’s electoral appeal. What is the UKIP manifesto if it is not anti-Bulgarian and anti-Romanian? So when Farage uses the word ‘xenophic’ interchangably with ‘racist’ and ‘fascist’, a complicated xeno-racist analysis becomes unnecessary: UKIP policies are, by their leader’s own language, racist. Interestingly, the Edinburgh protestors shared this terminology, insulting Farage variously as “fascist sum”, “f***ing racist s**te”, and “xenophobic”. By their definition then, it was an anti-racist protest of some description. And yet Farage claimed they subjected him to “anti-English racism”. This poses an important question: is anti-racism anti-English? It is not mere semantics. We need a critical reflection on English identity. Why is it that an anti-immigration politician can transfix people in southern England, but seems alien when in Scotland? Farage’s answer is absurd. He blamed Scottish nationalists for being filled with “total and utter hatred” of the English – and presumably the English breed of racist politician. So what is the relationship between Englishness and racism? Daniel Renwick has argued that “the southern English in this country have a particular problem with anybody who is a bit different, and they completely dominate our society, and we as a population identify with that”. I tend to avoid discussion of UKIP, because it can distract us from challenging more fundamental issues of institutional racism and White supremacy. If we exceptionalise Farage’s individual bigotry, it only allows ‘mainstream’ politicians to posture as reasonable. UKIP’s second-place in the Eastleigh by-election did not suddenly resurrect Brittania from her grave. The British State has barely begun to acknowledge the crimes of colonialism – what it did to the Mau Mau, but not the Highland clearances. The ghost of Empire continues to haunt our culture: Royal weddings, warrior princes, Help for Heroes – common ground for Cameron and Farage. However, in this regard, Farage’s forray into Scotland was significant. It held a mirror up to the Westminster village, and English nationalism was the reflection. No surprise, given that 49% of UKIP voters support English Independence. It is a rarity in the London press when Englishness, not Scottish independence, gets portrayed as unreasonable. But last week Britannia looked uglier than Braveheart. This is because the Home Counties are gripped by the politics of hate and nostalgia: Scapegoating the EU and its immigrants, and harking back to a golden era, before the A8 accession (and probably before Black settlers came here from the Commonwealth). By contract, Scotland is pondering a progressive nationalism, an opportunity to shape its future, rather than remain trapped by the past. Great article. England does need to stop for a second and contemplate its racism and xenophobia, disguised as patriotism. When people see pregnant women and their unborn as threats to their country they have become completely dehumanised. Reading the Daily Mail is sadness-inducing every time an article is based on an issue which can be even at a stretch connected to immigration. Commenters seem to be frothing at the mouth, at the same time praising UKIP and Farage as their only saviours. And the Daily Mail is classed as the second most read news publication in the UK. Examples : ”A Czech woman is pregnant with quintuplets” (Comment: I bet she’ll jump on a plane to the UK to live on benefits!) or ”The narrowest house in England” (Comment: soon to be home to 10 Eastern Europeans!). They are so obsessed with immigration they relate it to anything. It has somehow become alright to consider whole nations as poorly educated, benefit grabbing, criminal and a health hazard (at least one UKIP candidate has said London would be a dangerous place to live due to Romanians and Bulgarians and their tuberculosis. The Daily Mail, where UKIP supporters congregate, even published a racist cartoon of a foreign doctor treating a UK patient with rural remedies from his country (warm cockerel blood I think). The ”humour” is beyond disgusting. They have forgotten (or perhaps aren’t even aware of) the pillaging and genocides carried out by their country all across the globe. In addition to that, they enjoy the freedom to travel and settle almost anywhere in the world, but think the same should not apply to others who come to their country. English people living abroad are simply called ”expats”, not job-stealing, resource-wasting unwelcome immigrants. It’s simply ridiculous. That’s like admitting they think others are second class citizens and migrating from the UK is different than to the UK, when all people should have equal rights and chances. The UK isn’t the world’s refugee camp.